Paul and I promised to love, honor, and obey (?) for the rest of our lives twenty-eight years ago today. Not so sure about the “obeying” part, but the rest has held up OK. We’re doing pretty well for an old married geezer couple. We’ve been on the “ups” and on some “downs” throughout our last 28 years, but we’re still here, we’re still together, and we are still in love… whatever love means! No seriously. It’s our anniversary today. And how did we celebrate this momentous event? Well, I had to take everything off the counters in the kitchen and seriously wash down every inch with spray cleaner, and then get some ant traps from the store and place them at incremental spots behind everything, because last night when Paul went to get a piece of fruit, there were a gazillion ants all over a couple of pieces of fruit that we leave out in a bowl on the countertop! Eek! He was like a girl with a mouse… I was dishing up supper and he scared the shite out of me with his “yeow!” and then all the commotion that ensued in order to kill all those little buggers! So today I was in kitchen cleaning mode. I haven’t seen an ant except for the one lone ant I smooshed early this morning who was roaming around where the fruit used to be (it’s now in the fridge!) and who is now history… I have kept the under-counter light on so I can spot any errant ants right away upon entering the kitchen. That’s been my day so far. 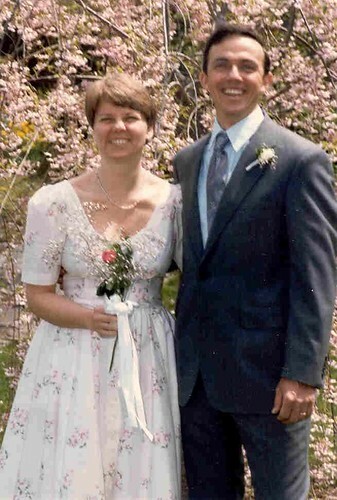 For Paul, he is celebrating 28 years of married bliss by going out early this morning and starting to fill in all the trenches he had to dig in the back yard, over the septic tank and various leaching fields because our septic system got blocked this week. We couldn’t flush or run the water for 2 days. Oh, that was fun. He dug up all he could, which was a LOT for a guy almost 69 years old, and then he broke down and called a drain and sewer guy, one who had been here a few years ago for a similar problem, and miracle of miracles, we called at 3 p.m. and the guy was here at 4:15 to help Paul get the problem solved. I ordered subs to be delivered for supper as we had no water and I thought it would be just easier. But by the time we sat down to our Italian subs to eat supper, the problem was all fixed, the drain/sewer guy was off in his little truck with his dog as company, and our sewer adventure was at an end. So today was fill-in-the-trenches day for Paul. I’d say that, overall, it’s been a very memorable 28th Wedding Anniversary. No, we are not going out to eat. No, we are not getting clams or having lobster either. Paul has gone to sell his lobsters, as usual, down at the harbor, and I am going out to that kitchen soon to put together a Perfect Potato Soup that I saw the Pioneer Woman make on her Saturday cooking show today. I love potato soup. Here’s the recipe I’ll be making for supper for our Anniversary this year. No cards are being exchanged. My orders. I don’t shop, and I wasn’t in the mood to sit upstairs at my printer/computer and make a card for him, like I usually do, because my chair up there is painful to sit in for me these days. We don’t need cards… we don’t need any more stuff… but we do need dinner every night so Wedding Anniversary Perfect Potato Soup is what’s for dinner! Now on to our 29th year and may this year bring no septic tank problems and may both our dogs make it all the way through another year with us! Cheers for the glorious state of marriage! Plain vinegar Nina? I have NO plain vinegar in my house! Drat… but I will give it a try when my shopper/hubby goes to the store next time… I wonder if wine vinegar would get the ants just tipsy enough to forget where the crumbs are hiding? Plain vinegar, wiped in all places where ants have lingered. Works for me. I think you are a sweet and awespme couple. To many more wonderful decades together! I’m going to wish you a Happy Anniversary Weekend – as you and Paul deserve a do-over. Hope your Sunday is much kinder and gentler! Happy day and best wishes to you both, along with the furkids. Glad the other stuff is done for you. My dress was off the rack at Talbots for $99 as I remember… I’d never pay that much for a single item of clothing any more! I’m “glistening” now from head to toes after putting together the potato soup… it’s bubbling away in the big pot… so it’s a go. But it warmed WAY up here and it’s like the end of June or something… very warm and I do not like warm or hot or any shades in between…I like cool and cooler best. Ah well, not gonna happen anytime soon this year… just have to glisten for many more months to come. I guess you didn’t need the well wishes from the ants. They have suddenly appeared here also. Glad the sewer problem is fixed. hat is a bad problem. “No seriously. It’s our anniversary today. And how did we celebrate this momentous event? May you have many many more happy years together…I have 59 under my belt. What a pretty dress you wore for your wedding day. Handsome, happy couple. May you celebrate many more years together. Happy anniversary! I’m glad you have a good plumber too. Maggie, Fish dinner! Now that’s what I should have done… but I didn’t think of it soon enough. Maybe tomorrow. Happy Anniversary Bex and Paul! What a beautiful wedding picture, you both look so very happy! Attila and I moved in together 21 years ago today, so it is a sort of anniversary for us too. Similar in some ways to yours, Attila is cutting the grass and transplanting in the garden, and I am running all over the place catching up with the shopping. And supper… fish dinner!